I’ve had a passion for craft and textures from an early age, influenced by my parents. My mother made everything from soap and cottage cheese, ginger beer and tatted lace edgings. My father, an old school European trained bespoke tailor. I grew up with vege gardens, sewn toys and clothes. Walking the beaches for shells and catching my own snapper on dad’s bamboo surf casting road. Those where the days when supermarkets just were becoming popular and a fabric shop was as common as the local bakery. I didn’t have a commercial pair of jeans until I was at least 12! My mother taught me knitting and how to make “real mess”. So I’m grateful for my heritage and a similar life as a growing child. Anything and everything I can get my hands on. I’m a bit of a sponge. I love texture. Handmade groove? One off, quality jewellery pieces –especially love to design for clients. Aspiring creative sewer! I enjoy being a creative model for others through volunteering my skills and encouraging others to look at things in different ways. I do love music and at the studio I rely on my other studio mates ipods for background music. We zone out together! I’m not like that… rather have a good old dessert which we all share and go “googie over” and enjoy time with them and learn more about them as people and crafters. One I have already done in March 2011. Workshop with Lorraine Dowdle – SRA. NZ glass bead maker and wire artist. A workshop on promoting your craft to others and potential customers. Lots of craft shows and displays with another crafter friend – why? 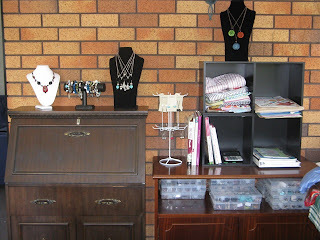 To have fun and soak it all up and meet other crafters…Would love to go a beading workshop or two in Australia or the US. Would love to know about more events in NZ. Probably not as well as I should! I work by appointment at my studio and fit designing and classes around what we do. I make sure I get 2 clear days, unless family illness keeps me home. My husband works from home so we take turns with organizing family commitments and being there for our 3 children. Planning ahead helps, texting and a crockpot! I keep the jewellery side at the studio. The house gets too chaotic otherwise. The sewing side is often on the dinning table because it’s 2m long! I do have a conservatory at home that’s handy for sewing in the sun and looks out over the garden. The cats usually come in and have a nap and keep me company. My studio is shared space and is a basic– but lovely. At the moment a floor rug and woolly ugg boots are much needed .It’s a bit nippy in there. Must do that very soon. Creatively – some jewellery components I’m trying to source. Brass metal flowers that you can roll the petals and shape and layer for a design I want to do. A house cleaner would be nice and a garage to put the car into on a wet day. Our garage is full of other stuff! Hi Helen, love your dragonfly jewelery, and I wouldn't mind a Housekeeper either.